With the release of Songs from Black Mountain, the boys from York, Pennsylvania known collectively as Live are back with their first new studio album since 2003’s Birds of Pray. The band’s re-emergence has been met with mixed emotions from its fans, with some longing for the harder rocking fare of its early ’90 outings, such as Mental Jewelry and Throwing Copper, and others feeling satisfied just to have fresh material in hand, even if it doesn’t reach the stellar heights of the group’s previous endeavors. In effect, Live has mellowed over the years, and although it doesn’t pack as much of a punch, the outing does contain all of the elements that attracted listeners to its music: gripping vocals from Ed Kowalczyk; impressive musicianship from guitarist Chad Taylor, bassist Patrick Dahlheimer, and drummer Chad Gracey; solid production; good tunes; and the raw synergy that defines the ensemble. Previously compared to U2 and R.E.M. and known for crafting idealistic and overtly spiritual tunes that sound like anthems, Live took a lighter, more acoustic-minded approach to its hastily recorded, seventh studio album Songs from Black Mountain. While the music is good, its lyrics prove to be the weak link that sometimes sinks the affair. A closer look reveals the set’s mountaintops and its valleys. Some of its high points include The River, Show, Wings, and Where Do We Go from Here?, the latter of which, with its introspective lyrics, is probably the strongest selection on the collection. All four of these songs are classic rockers that easily could find their way to FM radio play lists. Nevertheless, it is difficult, at times, to distinguish one selection from another. This is one of the chief musical flaws of Songs from Black Mountain — too many of its tracks sound too much alike. It’s a typical deployment of Live’s formulaic approach of vacillating between loud and soft segments, and after awhile the uniform dynamics begin to wear thin. Some of the lyrics hit home, such as those on Where Do We Go from Here?, though others seem to be trite (Mystery’s "My ammunition won’t load into my gun"), predictable (Show’s "You take me straight to Heaven by going straight through Hell"), and incongruous (Sophia’s "I need ya like a junkie needs a vein"). In the case of Songs from Black Mountain’s religious allusions (Love Shines, Wings), the lyrics seem a bit confusing and ill- fitting. The final three songs on the album (All I Need, You Are Not Alone, Night of Nights) produce nothing memorable and also seem to run together. Perhaps, if the band took more than three weeks to record the project, these compositions could have been reworked into a more polished form. In the final analysis, Live’s latest effort Songs from Black Mountain is a good, if not great, album that won’t persuade the non-committed to join the party. Granted, the music can soar to new heights, but it also, at times, can be terribly predictable. Both the musicianship and the production are first-rate, but the oft-tired and clichéd lyrics prove to be its Achilles’ heel. 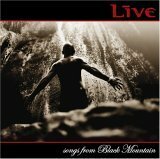 Although Live’s fans likely won’t be impressed by Songs from Black Mountain, they almost certainly will enjoy it. For them, at least, it’s worth a spin. Songs from Black Mountain is available from Barnes & Noble.